This Saturday was almost just as cold as yesterday, just without the strong winds. I think it was about 22 degrees which doesn't sound too bad, but I'm still trying to adjust after having temps hit 60 only a few days before. I hardly took any photos compared to other days, there was just not much to see and the sky was a thick grey that only let through a faint circle of light where the sun should've been. It was kind of just a depressing, dreary day -the kind you might have much later in the season; around late January or February. I guess the weather had really gotten to me because or the first time in a long time I felt kind of half-crazy for deciding to go outside in the cold and walk around in a circle for over an hour. But I guess that is the point as you just never know what you're going to see. 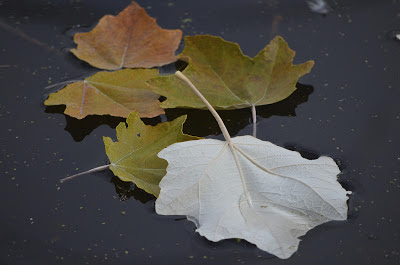 And in order to see (and learn) about nature you have to do get out there often, even on crummy days. The one -and almost the only- interesting thing I spotted was one lone, male Wood Duck on the "Duck Pond" on the southwest side. I'd seen him here in the same spot exactly one week ago last Saturday, only he was with a group Mallards then. Today he was completely alone without another duck to be seen anywhere. It seems as though we were the only two living things in the park, and maybe that is why he let me get so close to him today. They sure are beautiful when you get to see them close up. Only a little bit of sun would have helped. As I made my way around, I spotted only a handful of other birds; Blue Jays, Juncos, Tree Sparrows, Cardinals, Downy Woodpeckers and once again a Northern Shrike. Nothing blog-worthy about any of them though. 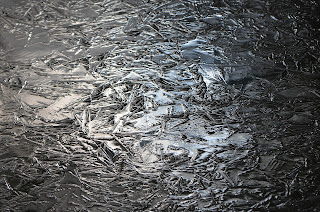 From the foot bridge over Shingle Creek on the north side I noticed how the sun was reflecting off the new ice that had probably formed so quickly in the last day or so. 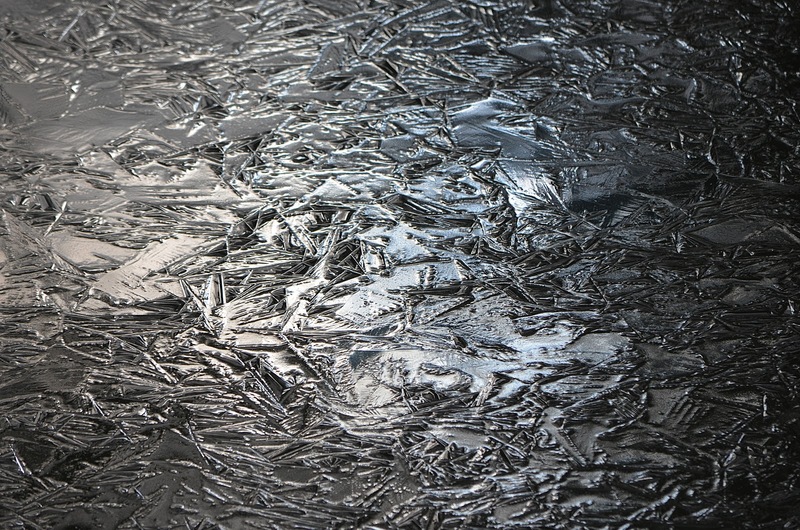 I thought it was interesting and sometimes I like the "abstract" forms you can find in nature sometimes. On Wednesday the day before Thanksgiving this year, we hit a near record high temperature of 61 degrees! Of course that didn't do me a bit of good as I was working all day but I was hopeful that the warmth would hang around just one more day to enjoy on Thanksgiving day. It didn't last though and on Thursday the temps started plummeting around noon and by 2 or 3pm it was blowing snow sideways on a strong wind. So on my first visit to the park this Friday, I was greeted to about half an inch of fresh snow, temps around only 20º and an unrelenting wind that made it feel more like in the teens! I had to dig out my heavy winter clothing for the first time this year and it was quite a shock to experience such a drastic change. For the first 1/3 of my walk I was actually cold and having a hard time warming up. 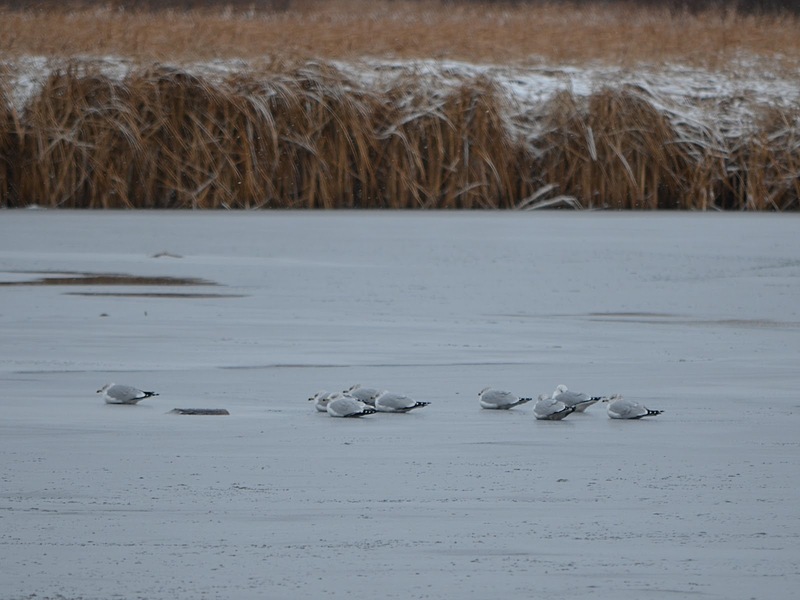 The water was completely frozen over almost everywhere and out in the middle of Palmer Lake I spotted this group of Ring-billed Gulls hunkered down -strangely facing into the wind. Gulls are getting to be fairly common at the park always more noticeable in the early spring and late fall when the weather can be kind of nasty. I don't tend to take a lot of pictures of them because I guess I consider them kind of a nuisance bird more than anything. I often have wondered if they are eating fish out of the lake, or scavenging the surrounding areas, or both. I'm not exactly sure what attracts them to the area. On the north side I spotted a Northern Shrike again right off the paved trail. He flew in from out of nowhere and perched somewhat near me but behind a lot of thick brush. I tried walking back and forth for a better view but could find none. Then he moved to a different tree and I followed hoping for a better shot. I ended up walking out into the marsh a ways and was surprised to find I was able to walk more quietly than normal due to the fresh snow on top of all the normally crunchy weeds. The Shrike moved on more time and this was the closest I got to him when he picked a large Buckthorn Tree now behind me again. I have a strong feeling I'm going to see them LOTS this season so I think I may even keep a record of how many times I spot one! They are fascinating birds who kill other smaller birds and rodents, then store them somewhere (called a cache) for later eating. When the store this food, they often "impale" it upon a twig or hang it between the crook of two twigs. 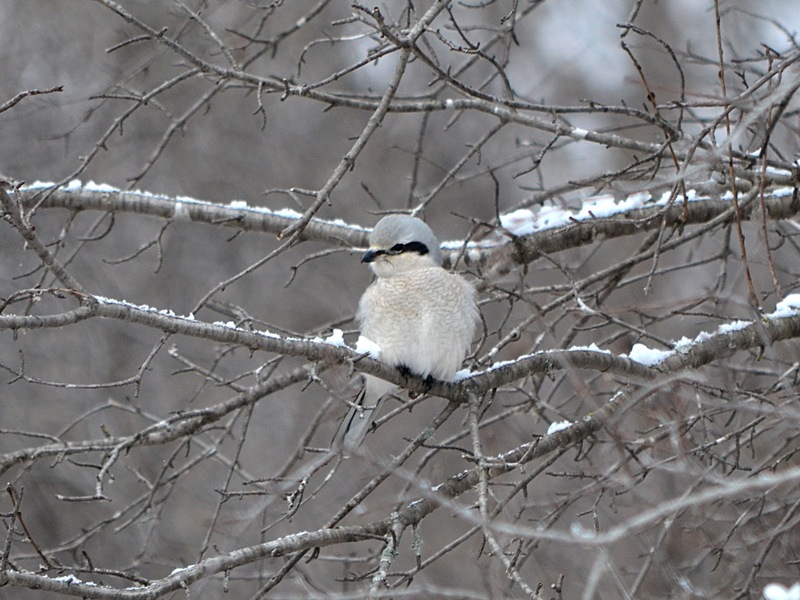 Earlier this year on November 11th, I got to find my very first Northern Shrike "cache" but not at Palmer Lake Park. This was along Shingle Creek on the south side of I-694 near Centerbrook Golf Course. I noticed what looked to be a dead bird in the middle of a pine tree about eye level. 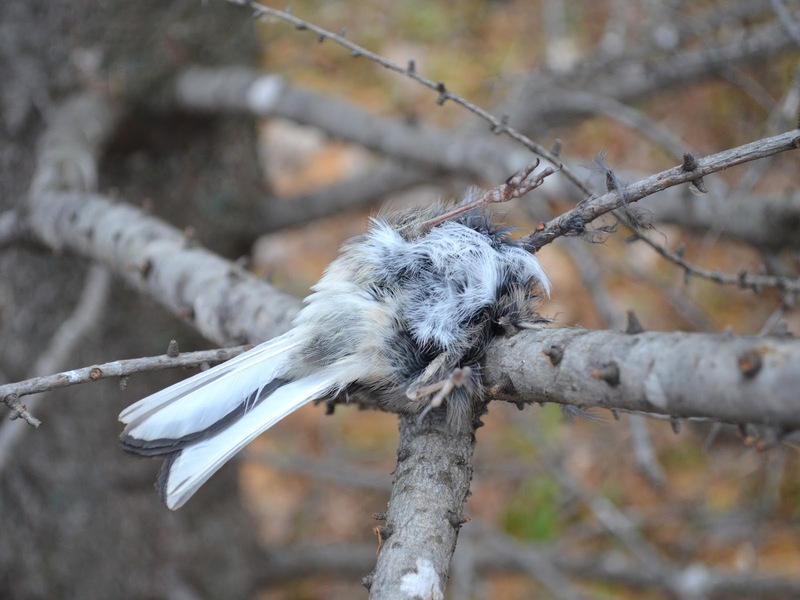 Upon closer inspection, it was a Chickadee who had obviously been attacked by a Shrike and stored here for later. I had been on the lookout for this for years ever since learning of Shrikes in our area but this was my first find! A Rare Sighting? See comments for proper ID! This Sunday morning I arrived at the park just after 7:30am. The still rising sun created a nice sky with rays peeking out from behind puffy white clouds in the east. As I walked around the park it was still a bit dark in places but the sun gradually crept in and created a warm glow on everything. 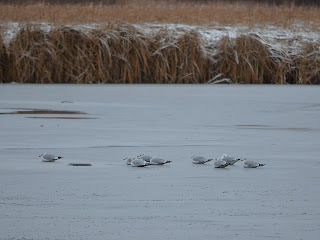 It was ideal light to see and photograph birds but the problem is that I was just not really seeing any. At the south parking lot, I did see a mature Bald Eagle perched just above the water out in Palmer Lake but my camera was not able to focus through all the cattails. Other birds I spotted included Juncos, Cardinals, Starlings and large groups of Goldfinches that were making a lot of noise. I had walked nearly all the way around the park and could even see my vehicle again and I'd barely taken any interesting photos. 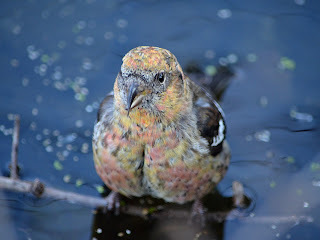 As a last-ditch-effort, I decided to try sitting on the edge of the small pond on the east side where yesterday I spotted a few things such as Sparrows, House Finches and a Grackle. I noisily made my way in, found a good fallen log and sat down facing the water. I'd only been sitting there just a few minutes when a bird flew directly towards me and landed on the very log I was sitting on, only about 3 feet away. Now my philosophy is that ANY bird that's closer than 10 feet away is always worth photographing so I quickly drew up my camera to focus. When it did, I realized this was no ordinary or familiar looking bird to me. The first feature that struck me as odd was that it's long bill was "crossed" at the tips, then secondly it's coloring was unlike anything I'd ever seen before -a beautiful mottled pattern of pale red and yellow. Within seconds I realized there is only one species this could be -a Red Crossbill! 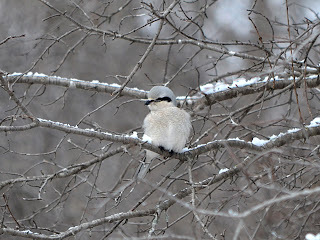 I'm not at all familiar with them but without my guide book in my back pocket, I seemed to remember that they are one of those "northern" birds found mainly in the far upper portion of Minnesota. Not quite being sure if that were the case or not, I was thinking this was a fairly rare sighting as I wildly snapped as many pics as I could. Surprisingly the bird was not at all skittish despite being only feet from the end of my camera lens. It hopped about the log to move downwards and closer to the water and I found myself actually backing up my lens further and further to try and keep him in focus. Finally he hopped right down onto a small branch that was just beneath the surface of the water and began to dip in his crossed bill for a drink of water! I couldn't believe I was getting to see this at such at close distance -it was amazing to see such a unique bird to this area so intimately! After taking 3 or 4 quick drinks, it finally flew up and perched somewhere behind me in the thick shrubs surrounding the water. I'm not sure but it looked like there may have been a second one near it but it was hard to tell with the sun now in my eyes. Again I'm not familiar with this species at all but I'm guessing the one I saw was likely a male with non breeding plumage? From what my field guides say, the females don't have any traces of red coloring. Indeed my guide also shows this species wintering only as far south as Duluth, but that they are also known to be "irruptive" meaning that they may move to different and new areas in search of food. Quite a sighting for me though - I love when I get to see a particular species for the first time ever at Palmer Lake Park! Finally the sun was back this Saturday and though it's already mid-November it felt almost like a late Summer day. Today marks my 2nd sighting so far this season of the Northern Shrike, though I only managed a few very long distance photos of him. Beside the Shrike, there was a fair amount of interesting birds to be seen today including; American Goldfinch, Red-bellied Woodpecker, Downy Woodpecker and Blue Jay. 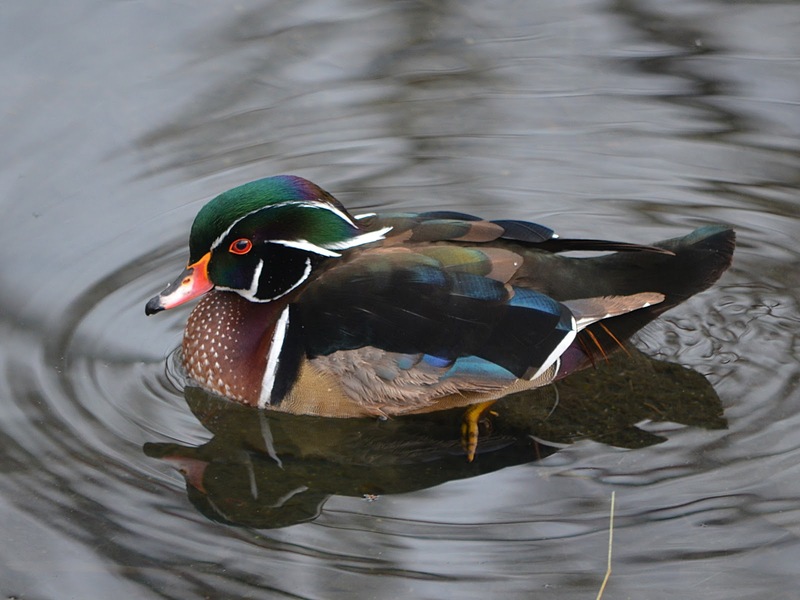 But maybe the most beautiful bird I saw today was this male Wood Duck in the southwestern most body of water I like to call "The Duck Pond." 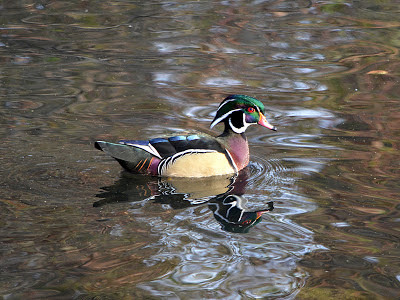 I was surprised to see a Wood Duck still in the park and thinking that he'd better get a move on back south pretty soon! This Sunday the Friends of Palmer Lake Park were doing a small-scale Buckthorn removal project at the park. The only problem was that the weather was downright terrible. After a string of relatively nice warm weather for November, it took a turn for the worse. I arrived a bit early, just enough to walk from the west parking lot to Shingle Creek and back again. There wasn't a whole lot to see in this short distance; some Juncos, Tree Sparrows, Chickadees, Canada Geese and Mallards in the creek. 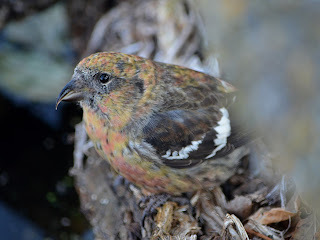 But I did see one interesting bird along the way that I don't see too often but am becoming more familiar with now. This Fox Sparrow was moving around in the lower parts of the dried up cattails. 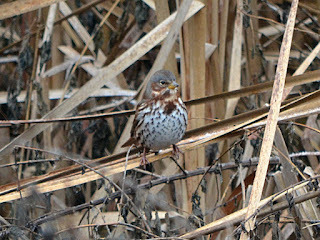 If you ever see what looks to be a common looking Sparrow but seems too large then it is probably a Fox Sparrow. The other clue is large patches of solid grey coloring around the head and neck with other common sparrows like Tree Sparrows and Song Sparrows wont have. I just read that Fox Sparrows nest in Canada and are only ever migrating through Minnesota -which would probably make this the last still-migrating bird I will have seen this season! After my very short walk I returned to the west side to get working on some Buckthorn removal as planned. The weather turned out to keep everyone else away save for just 3 of us, brave enough (or dumb) enough to want to work for a couple hours in this crummy weather. We made fantastic progress on a small area which you can see here on the FPLP facebook page. One of our "friends" for the day had said that he'd seen what he thought was a Snow Goose on the other side of the park before we started working. Afterwards we decided just for the heck of it to drive over to the other side and sure enough he was still there! 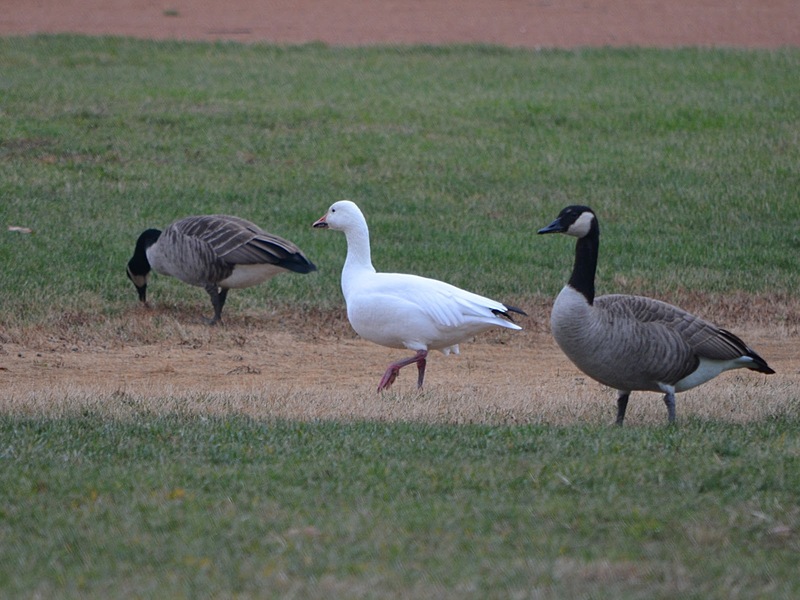 This one, lone Snow Goose had tagged along with a small group of 10-15 Canada Geese who were moving slowly across the baseball field. As we watched we could tell that the Geese weren't exactly keen on this new, and different looking member of the group. When he would get too close, different Geese would nip at him and chase him away. It made me wonder why -or how- he got separated from his own group and ended up here. I'm pretty sure I've seen Snow Geese flying over the park before but this marks the first time I've positively identified one actually in the park. So another new species documented today! I made it around the park today in near record time –just under an hour! I guess the rain prevented me from wanted to poke around any more than I did as everything was just wet. 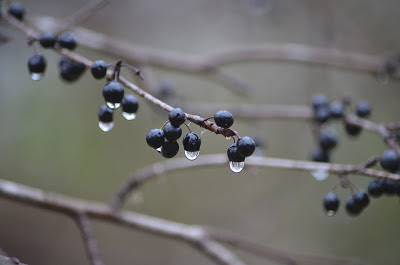 The raindrops clung to everything including these Buckthorn berries and I thought it was kind of an interesting sight. Still seeing the same mix of birds including Dark-eyed Juncos, Red-tailed Hawks, Cardinal, and lots of American Tree Sparrows. 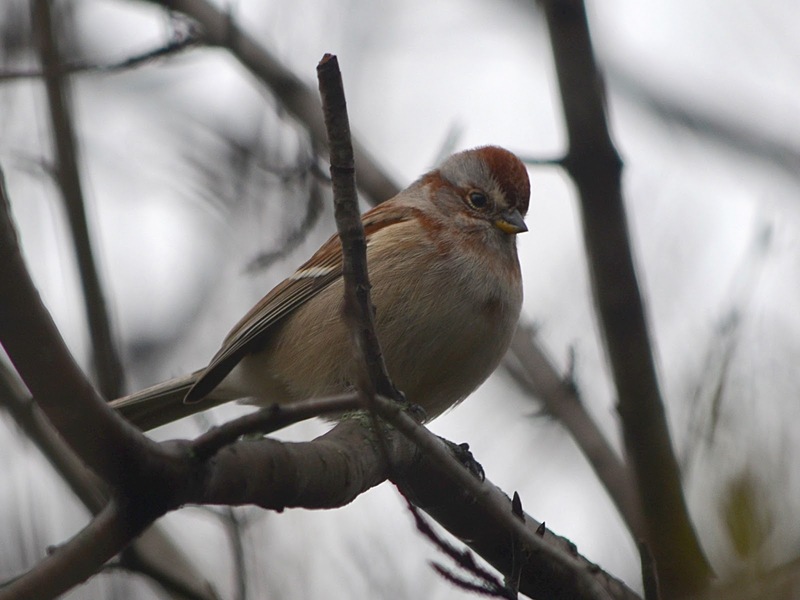 I was lucky enough to catch a half way decent photo of this Tree Sparrow somewhere along my route. It is maybe the closest I've been able to get to one so far. 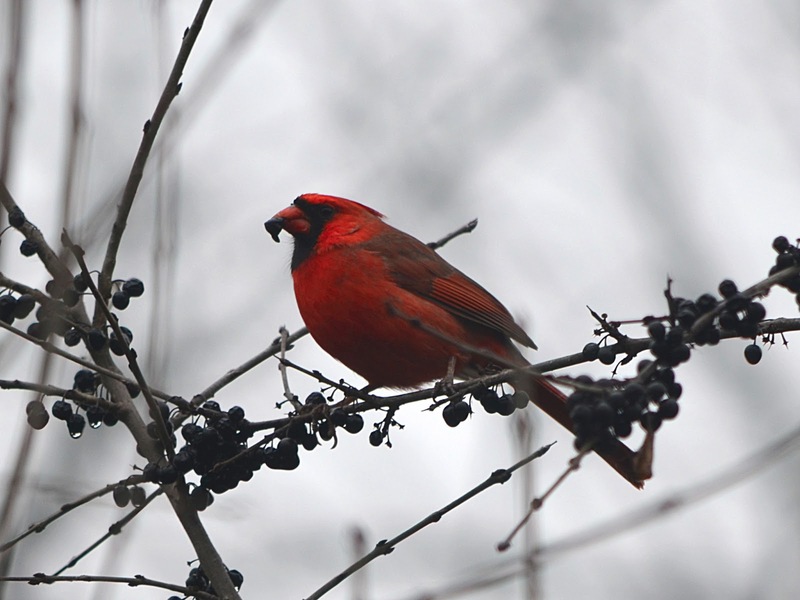 And speaking of Buckthorn berries, I spotted this male Cardinal chowing them down near the end of my walk. I guess the birds don't know that these berries give them diarrhea! Sunday morning at the park was another quite and uneventful walk. Most leaves are down already and it's hard to find any colorful ones still attached to anything. I took only 21 photos during my entire walk. 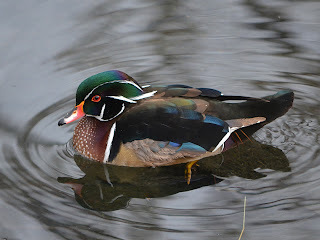 The birds I saw included Mallards, a pair of Red-winged Hawks playing high above, Cardinal, Ring-billed Gulls and Dark-eyed Juncos. Well the behavior of people still amazes me as much as nature does. 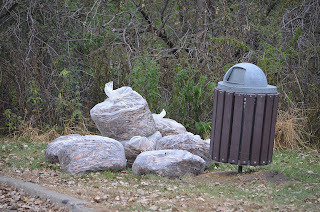 It almost never fails; every year I seem to find fallen leaves packed into plastic bags dumped in the park! I just cannot get over the irony of this. Whomever did this put something completely organic and compostable (in a very short time mind you) into plastic bags which will take many many years to decompose! I suppose you could say that they were "assuming" somebody would pick it up for them, but geez, what if they don't? They are quite literally making a conscious decision to pollute the park in my humble opinion!!! I just don't quite understand the thought process here. Well there was hardly anything else of interest to see today and for such a nice day it was eerily quiet. 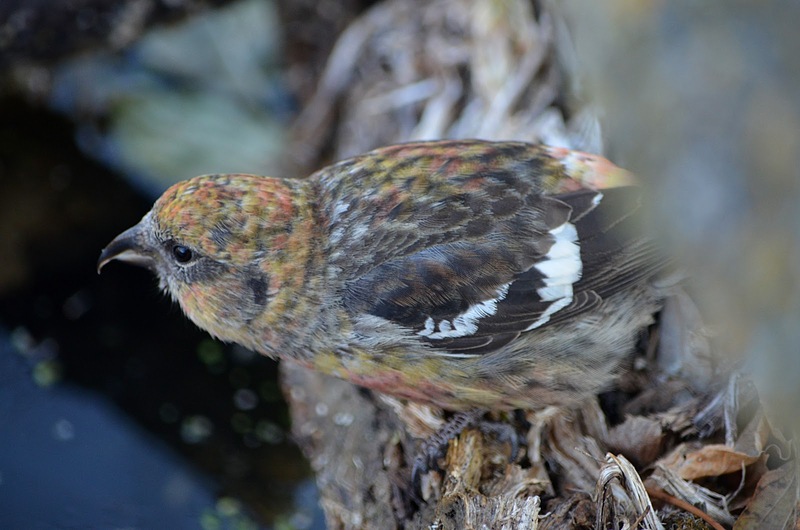 Our "seasonal" migratory birds definitely seem to be gone now, leaving the park to the Woodpeckers for a while. 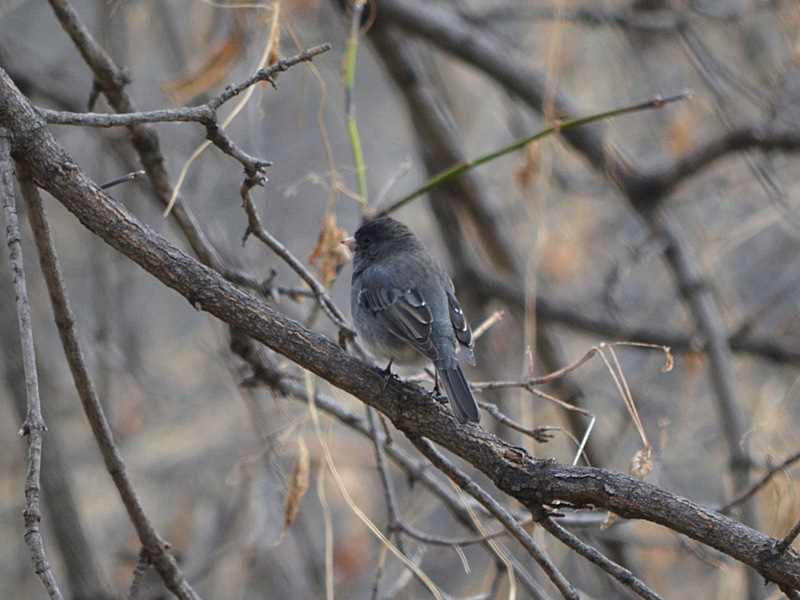 The only bird I did manage to get a shot of was this Dark-eyed Junco on the north side. For me they are another one of those birds that I never tire of as I cannot seem to get that perfect shot that I'm looking for. They are somewhat dull in color from the front but I've learned that they can be quite colorful from the back, showing some interesting blueish and purpleish color mixed in with the slate gray coloring. Somewhere in the last few days, the city (of Brooklyn Park?) 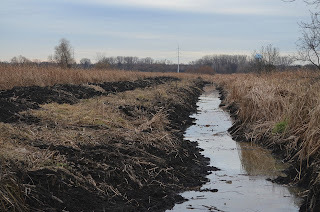 decided to dredge out the drainage ditch that runs northeast to southwest and connects with Shingle Creek. The mud and muck that was dug out to make the ditch deeper was piled in gigantic mounds on the inside edge of the ditch, making an awfully ugly sight. Everybody that I know from the park has been looking at this and wondering exactly why it was done. I don't have a definitive answer but I did hear some stories that this is done in response to home owners living around the park who have concerns about water in their basements. I'm not sure if that's completely accurate or not. I think about just how far away the nearest residential home is to this area and it's quite a ways.